A 45-year-old female patient suffering from carcinoma of the breast was advised for chemotherapy. Chemoport catheter was inserted from the right side of the neck at a local hospital. The patient complained of breathlessness on mild exertion along with giddiness few days after the procedure even before the start of chemotherapy. 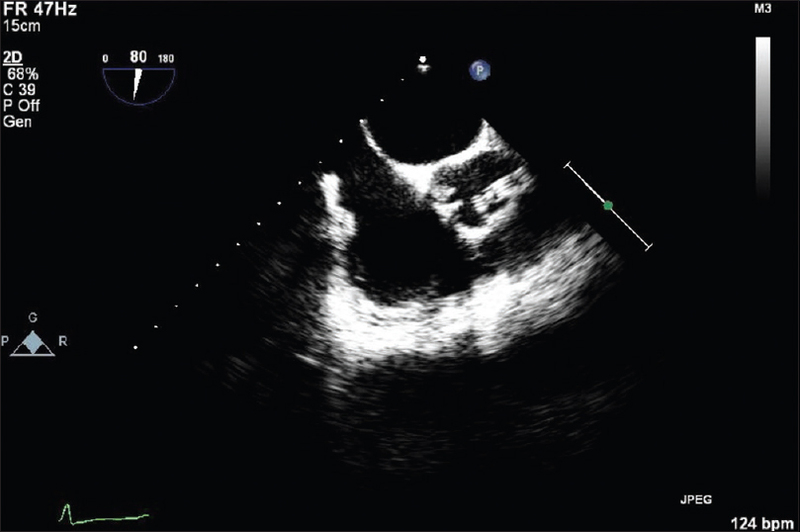 Echocardiographic examination revealed severe aortic regurgitation (AR) with aortic valve endocarditis and was advised for aortic valve replacement [Figure 1]. The patient was referred to our center for further management. 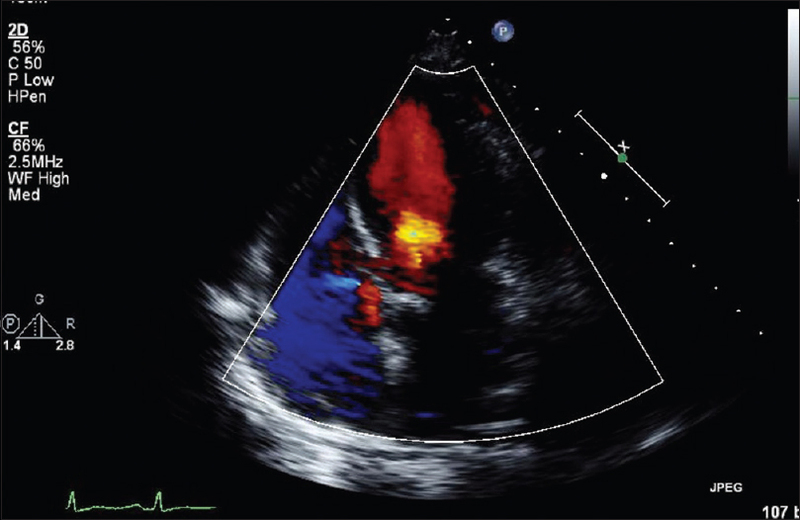 Transesophageal echocardiography confirmed (AR) and also showed elongated tubular structure (vegetations?) above aortic valve leaflets [Figure 2]. 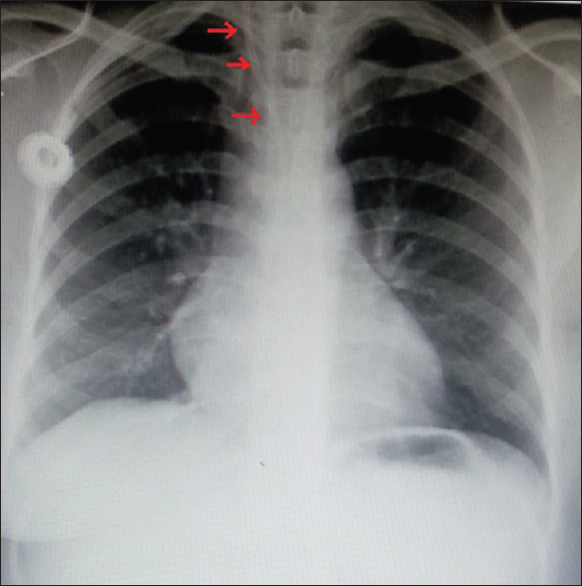 Chest X-ray showed the course of chemoport catheter more toward the midline [Figure 3]. Hence, computed tomography scan was performed [Figure 4]. The passage of chemoport catheter was observed through the right internal carotid artery and ascending aorta till aortic valve. The “arterial” catheter was removed and internal carotid artery was repaired. Subsequently, chemoport catheter was inserted through the left internal jugular vein under ultrasound guidance, and proper placement was confirmed by pressure monitoring and chest X-ray. Now, the echocardiogram revealed absolutely no AR. Incidences of accidental arterial puncture occur in about 1% and 2.7% of jugular and subclavian approaches, respectively. Arterial cannulation was reported in <1% of cases. However, inadvertent carotid or subclavian arterial injury can lead to serious complications such as pseudoaneurysm, hematoma formation, stroke, and fistula. Direct aortic cannulation is an exceedingly uncommon event with significant morbidity and mortality. Arterial puncture can be recognized by pulsatile flow, but these findings may get obscured in patients with hypoxia and shock. Blood gas analysis may be helpful to confirm the arterial blood, but it is not suitable during the procedure due to time delay. Chest X-ray can guide about the course of the catheter, but it is not always a reliable method for preventing or readily detecting inadvertent arterial cannulation. Pressure monitoring and ultrasound guidance can reliably prevent accidental arterial puncture. Ultrasound guidance, in comparison with anatomical landmark techniques, was associated with 71% decrease in catheter-related complications for internal jugular vein placement. A rare case of iatrogenic type A aortic dissection caused during mediport catheter and venous catheter insertion into the false lumen of Type B aortic dissection has been reported., However, in the present case, apart from arterial cannulation, the catheter went up to the aortic valve causing AR by interfering with the aortic valve coaptation. In the absence of any previous medical records, we presume that chemoport catheter insertion might have been performed using anatomical landmark technique and not by ultrasound guidance at previous hospital. A chest radiograph should have been obtained immediately after the catheter was inserted to verify its correct position. Failure to obtain a chest radiograph under these circumstances does not meet the minimum standard of care. Even though echocardiographic finding of catheter in aortic root was misinterpreted as vegetations like structure at the previous hospital, computed tomography scan imaging definitely clarified the diagnostic dilemma in this unfortunate clinical situation. Blaivas M. Video analysis of accidental arterial cannulation with dynamic ultrasound guidance for central venous access. J Ultrasound Med 2009;28:1239-44. Garg N, Noheria A, McPhail IR, Ricotta JJ 2nd. Embolic strokes after peripherally inserted central catheter placement. Ann Vasc Surg 2010;24:1133.e1-4. Othman H, Rosman H, Saravolatz L, Rama K. Aortic cannulation: An unexpected complication of central venous catheter placement. J Cardiothorac Vasc Anesth 2017;31:e52-3. Rezayat T, Stowell JR, Kendall JL, Turner E, Fox JC, Barjaktarevic I, et al. Ultrasound-guided cannulation: Time to bring subclavian central lines back. West J Emerg Med 2016;17:216-21. Tsukashita M, Deanda A, Balsam L. Type A aortic dissection: A rare complication of central venous catheter placement. J Card Surg 2014;29:368-70. Bas A, Goksedef D, Kandemirli SG, Gulsen F, Numan F. Central venous catheter insertion into the false lumen of a complicated aortic dissection. Scott Med J 2017;62:115-8.